Astrophotographer Terry Hancock took this image as part of his mosaic of the Gamma Sygni region. This stunning image is part of the diffuse emission Gamma Cygni nebula, otherwise known as The Butterfly Nebula. 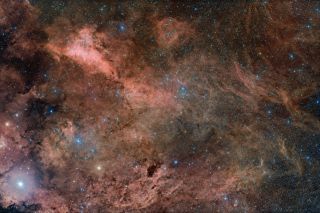 Astrophotographer Terry Hancock took this image as part of his mosaic of the Gamma Cygni region. The image was taken from his backyard observatory in Fremont, Michigan on May 29. "We have had some wonderful clear skies over here in West Michigan in the past week," Hancock wrote in an email to Space.com. Hancock used a QHY11S monochrome CCD cooled to -20 C and a Takahashi E-180 F2.8 Astrograph on a Paramount GT-1100S German Equatorial Mount to take the image. Multiple exposures are made to collect enough light for an image that would otherwise not be evident to the eye.